Pick your power. Do you want something that’s electric or runs on fuel? If you have a smaller driveway and don’t require as much power we have the electric powered snowblowers, which are all single-stage. However, if you require something stronger, fuel is the way to go. How heavy duty are we talking? Single-stage or two-stage? Single-stage blowers are lighter, more compact and easier to handle than two-stage models. They are ideal for smaller jobs, like sidewalks, walkways, patios, decks and shorter (2 or 4) car driveways. On a single-stage blower, the auger (the blades in the front of the blower) spins at a high speed, chipping ice and snow and directing it out of the chute that throws it 10-35 ft away. These units can clear roughly 12” of snow. The nice part about a smaller snowblower is that they’re lightweight and easy to maneuver. Two-stage snowblowers are larger than single-stage, meant for bigger jobs. For these, the snow goes through a second-stage before being thrown out the chute. In addition to the auger that chips the ice and snow, the two-stage blowers have a high speed impeller that collects the snow and directs it out the chute that throws it from 10-45ft away. These units can power through snow up to 21.5” deep and are easy to control on hilly driveways. Clearing? The clearing width you’ll want your snowblower to have will be dependent on the size of the area you’re clearing. If the area is less than 40ft, you’ll want your blower to have a clearing width of at least 26 inches. If your area is less than 60ft, you’ll want a blower with a clearing width of at least 28 inches. Lastly, if your area is larger than 60ft we would recommend a snowblower with a clearing width of at least 30 inches. What surface are you clearing? 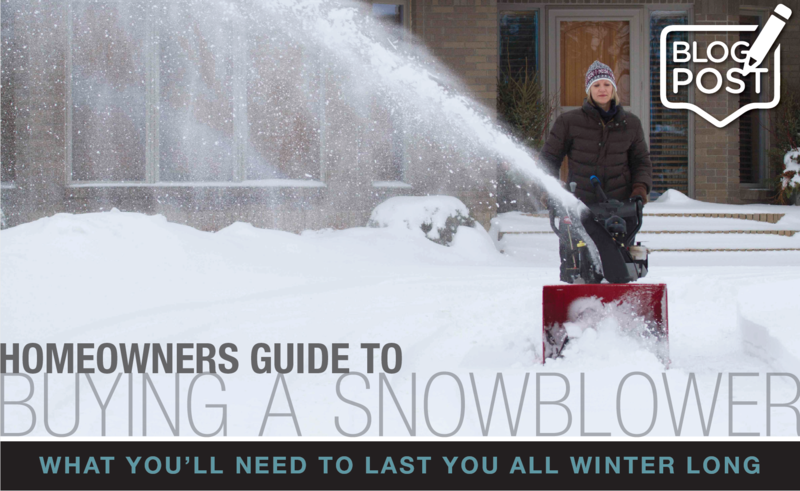 This is an important question when buying your first snowblower. What surface are you trying to clear? The single stage models come with rubber paddles that clear right down to the surface making them the perfect choice for paved, interlock, stamped concrete or decks. The rubber paddles don’t do these surfaces harm. The two-stage models however have a metal auger that doesn’t quite come in contact with the ground. This makes the two-stage the best choice for gravel or paved driveways. Warranty? Bonus! All our new snow blowers come with warranty. 2 year full warranty for homeowner models. Luxury? Snowblowers come with all sorts of “luxury” options (if you get into the bigger blowers). We’re talking quick stick chute control, electric start, LED headlights and hand warmers! Now that you know all the possibilities your future snowblower holds, you can come into Kooy Brothers and speak to one of our Product Specialists so we can help pair you with the right Toro Snowblower model to suit your application.